Sadly, we have lost yet another aviation pioneer, environmentalist and great humanitarian, this year... Samuel C. Johnson. He was one of the founders of the EAA’s Young Eagles program. He died of cancer in his home in Racine, Wisconsin, May 22 at the age of 76. 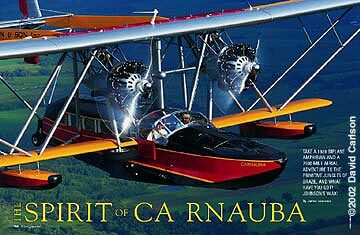 Johnson was the chairman emeritus of SC Johnson Wax and was as devoted to aviation as his father, who in 1935 flew a Sikorsky S-38 amphibian to Brazil in search of Carnauba palms, a key ingredient in wax. He was key in the construction of a replica of his father’s plane and produced a movie about its construction and epic reenactment flight in 1998. Samuel C. Johnson believed that business should serve a higher purpose in life, and be managed for the next generation versus the next quarter’s bottom-line. The man known affectionately by all as simply Sam, leaves a legacy of visionary leadership, remarkable success and great humanitarianism as a model for others. In 1967, Sam became chairman of S. C. Johnson & Son, Inc., and turned a $171 million wax company into a thriving, multi-billion dollar privately-held empire of four global companies employing more than 28,000 people. The fourth generation of his family to lead the family business, Sam observed that “every generation must bring something new” to the enterprise. He brought diversification and globalization to grow the business 40 times over, creating billion dollar brands like Glade®, Raid® and Pledge® and bringing Windex® and Ziploc® into the family’s portfolio. Sam created the modern new product development organization in 1957 that remains the definitive model for companies still today. 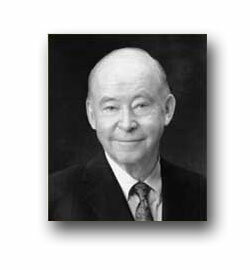 He summed up his business strategy simply as: “New products, new geographies, and every few years, an acquisition.” Today the Johnson name sells household packaged goods, institutional products and services, an array of financial services and outdoor recreation products in more than 110 cuntries worldwide. Sam brought family front and center in the family enterprises. He pioneered groundbreaking family-friendly policies, which have helped to earn his businesses “best place to work” recognition around the world, even integrating family into corporate marketing campaigns. His film, Carnauba, A Son’s Memoir was a testament to the importance he placed on family personally and professionally. Sam cultivated and sustained the strong values and high ethical standards of the Johnson leaders before him, and upon which the companies have flourished. He was the catalyst and architect of This We Believe in 1976 which is the touchstone of these principles and philosophy, and continues to guide corporate actions yet today. As his companies and profits multiplied, so did his philanthropic endeavors. While most companies hold corporate giving below 2 percent, Sam kept his at 5 percent, giving generously to efforts to improve the quality of life around the world, particularly in the areas of environment, education and the arts. Scholarships, grants and endowments totaled more than $200 million while he was Chairman, benefiting a variety of notable local, national and global causes and organizations, including among others: Cornell University, The 21st Century Preparatory School, Next Generation Now, the Martin Luther King, Jr. Birthplace Museum, Sustainable Racine, The Nature Conservancy, the Smithsonian, The Prairie School, the Racine Art Museum and the Downtown Racine Corporation. Described by Fortune magazine as "corporate America’s leading environmentalist,” Sam was a founding member of the World Business Council for Sustainable Development, and was named in 1993 to the U.S. President’s Council on Sustainable Development. From 1990 to 2000, he served on the Board of Governors for The Nature Conservancy, acting the last two years as Chairman of the Board of Governors. Most recently, he was a director of the World Resources institute. His civic service included 23 years on the Board of Trustees at the Mayo Foundation, serving as Chairman of the Board for seven years, and most recently as Trustee Emeritus. He was a member of the President’s Council of the Experimental Aircraft Association, a Regent Emeritus of The Smithsonian Institution, and a member of the Council of Advisors for the National Geographic Society. He was Chairman of the Board of The Johnson Foundation, Inc.
Sam’s leadership was recognized with many awards throughout his life. In 1992, he received a Lifetime Environmental Stewardship Award from the United Nations Environment Program. In 1993, he was inducted into the U.S. National Business Hall of Fame by the Board of Editors of Fortune magazine. In 1994, he was presented the Charles A. Lindbergh Award for his lifetime of contributions to furthering the balance between technological advancement and environmental preservation. In 1995, he was presented the Rene Dubos Environmental Award for leadership and commitment to improving both natural and cultural environments. In 1997, he was presented the Experimental Aircraft Association’s Freedom of Flight Award for his contributions to aviation. Among his many other awards, he was honored with the Order of the Sacred Treasure by the Emperor of Japan, the Silver Medal of Paris by Jacques Chirac, and the Order of the Civil Merit by the King of Spain. proudest moment, achieving what only a handful of family companies have ever done. He was currently serving as a Director of Johnson Outdoors Inc.; Chairman of the Board of Johnson Financial Group; Chairman of the Advisory Council of the Johnson Graduate School of Management at Cornell University, Trustee Emeritus and Presidential Councilor of the University; and, Founding Chairman Emeritus of The Prairie School, a leading college-preparatory day school founded by his wife in 1965. Sam earned degrees from Cornell and Harvard Business School and served for two years as an U.S. Air Force intelligence officer. He held seven honorary doctoral degrees. 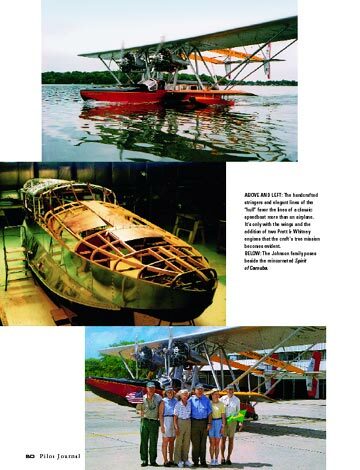 Take a 1928 biplane amphibian and a 7500-mile aerial adventure to the primitive jungles of Brazil, and what have you got? Johnson's Wax! ONCE UPON A TIME, A MAN WHO RAN A STRUGGLING FAMILY COMPANY DURING THE GREAT DEPRESSION HAD A VISION. He would make a daring journey in his fabulous flying boat in the hope of revitalizing the company's flagging fortunes. The man who would build Pan Am's famous transatlantic Clippers, Igor Sikorsky, also inspired the design of the S-38 Flying Boat. The Johnsons' original airplane was lost in an accident in 1928, but 60 years later, a meticulously crafted copy would take to the air. With its finely appointed cabin wrapped by a fuselage of hardwoods, the S-38 left Racine, Wis., for Brazil. This is the story of how his son, heir to that company once known as Johnson's Wax (today called S.C. Johnson), had his own epiphany: to re-energize the company and family spirit by making the same flight 60 years later—in the identical airplane his father had flown. There was just one rather formidable obstacle: The wonderful amphibian biplane that had carried Samuel Curtis Johnson's father all the way to Brazil in 1935 had unceremoniously sunk to the bottom of Manokwari Bay, Indonesia, in 1938. There were no others in existence anywhere in the world. Imagine this wonderfully sleek, 1930s-era speedboat, handcrafted in expensive hardwoods and lavishly decked out in cabin upholstery, curtains and appointments befitting a classy yacht. 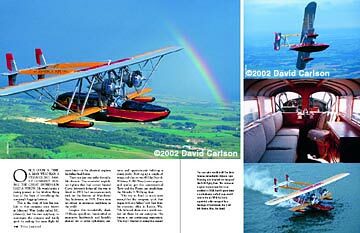 Now rig up a couple of wings and slap on two 450-hp Pratt & Whitney R-985 Wasp Junior engines, and you've got the quintessential Terry and the Pirates-era amphibian: the Sikorsky S-38 Flying Boat. ABOVE AND LEFT: The handcrafted stringers and elegant lines of the "hull" favor the lines of a classic speedboat more than an airplane. It's only with the wings and the addition of two Pratt & Whitney engines that the craft's true mission becomes evident. BELOW: The Johnson family poses beside the reincarnated Spirit of Carnauba. "Our trip to Brazil in many ways exemplifies the company spirit that began with my father," says Sam from his corporate office in Racine, Wis. "He believed there was a world market out there for our enterprise. His vision is our continuing inspiration. The trip I wanted to make was meant to keep that spirit alive." It turned out to be one of the greatest experiences of Sam's life, just as it had been for his father, Herbert Fisk Johnson. S.C. Johnson went through the same agonies that other businesses suffered during the Great Depression. "My father took over in 1928, in his late 20s," Sam explains, "and almost immediately the company seemed to be evaporating around him." Although he was determined to keep his company afloat, Herbert was concerned that the supply of the carnauba palm—the tall, slender tree that forms wax on the lower surfaces of its leaves—might become depleted. "Carnauba wax made our product better than anybody else's," says Sam. "At the time, it grew only in northeastern Brazil. So Dad decided he had to go to that place, where very few people from up north had ever been, to ensure the future supply of carnauba." When Herbert was told it would take a year by traditional land or sea routes, too long a leave of absence for a corporate head, he searched for alternatives. 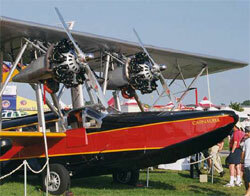 "And he bought this used airplane," Sam remembers, "a Sikorsky S-38 Flying Boat. He planned out the trip for a year, hired a 27-year-old Navy pilot, and off they went to learn the secrets of the carnauba palm." The flight went off without a hitch. Herbert was eventually able to bring back a wealth of information on the growth, cultivation and refining of carnauba wax. "From that time forward, everything turned around for the company," Sam notes. Today, S.C. Johnson is a multi-billion-dollar company that markets products in more than 100 countries worldwide. With all that success and a congenial, cohesive brood of spirited fifth-generation Johnsons to take over the four family enterprises, what need could there be to stoke an already blazing fire? "That simple inscription changed my life," Sam continues. "I reread it and started thinking about it. Something must have happened to him on that trip. Maybe I could better understand what he was all about—reconnect with what he was thinking and trying to accomplish."